Recently published data from the National Health Interview Survey (NHIS) found that 1 in 5 persons was in a family having problems paying medical bills, and 1 in 10 persons was in a family with medical bills that they were unable to pay at all. NHIS defines “family” as an individual or a group of two or more related persons living together in the same housing unit. The family perspective is important to consider when examining financial risk because significant expenses for one family member may adversely affect the whole family. Health insurance coverage is one way for a family to mitigate financial risk associated with health care costs, although health insurance status may differ among family members. A new report explores selected family demographic characteristics and their association with financial burdens of medical care (problems paying medical bills, paying medical bills over time, and having medical bills that cannot be paid) based on data from the 2012 NHIS. 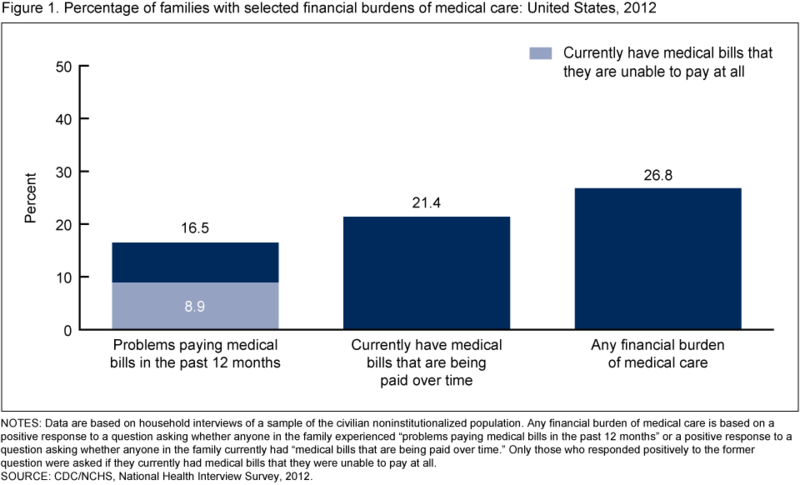 In 2012, more than one in four families experienced financial burdens of medical care. Families with incomes at or below 250% of the federal poverty level (FPL) were more likely to experience financial burdens of medical care than families with incomes above 250% of the FPL. Families with children aged 0–17 years were more likely than families without children to experience financial burdens of medical care. The presence of a family member who was uninsured increased the likelihood that a family would experience a financial burden of medical care. NCHS has new updates to Stats of the States that caputures vital statistics for all 50 states. During 1999–2010, a total of 5,149 deaths from unintentional carbon monoxide poisoning occurred in the United States, an average of 430 deaths per year. The average annual death rate from carbon monoxide poisoning for males was more than three times higher than that for females. The death rates were highest among those 65 or older for males (0.42) and females (0.18). The rates were the lowest for males and females under 25. Suicides are more common during the holidays or winter months? This has been another edition of statcast. Quarterly highlights from the National Center for Health Statistics. A new report from NCHS presents nationally representative estimates and trends for infertility service use among women aged 15–44 and 25–44 in the United States in 1982–2010. While greater detail on types of infertility service is shown for women, basic data on types of infertility service use, as reported by men aged 25–44, are also presented. • 12% of women aged 15–44 in 2006–2010 (7.3 million women), or their husbands or partners, had ever used infertility services. • Among women aged 25–44, 17% (6.9 million) had ever used any infertility service, a significant decrease from 20% in 1995. • In all survey years, ever-use of medical help to get pregnant was highest among older and nulliparous women, non-Hispanic white women, women with current fertility problems, and women with higher levels of education and household income. • The most commonly used infertility services among women aged 25–44 in 2006–2010 were advice, testing, medical help to prevent miscarriage, and ovulation drugs. Ever-use of infertility services was reported. The Health Information Technology for Economic and Clinical Health Act of 2009 authorized incentive payments to increase physician adoption of electronic health record (EHR) systems. The Medicare and Medicaid EHR Incentive Programs are staged in three steps, with increasing requirements for participation. To receive an EHR incentive payment, physicians must show that they are “meaningfully using” certified EHRs by meeting certain objectives. This report describes trends in the adoption of EHR systems from 2001 through 2013, as well as physicians’ intent to participate in the EHR Incentive Programs and their readiness to meet 14 of the Stage 2 Core Set objectives for meaningful use in 2013. From 2010 (the earliest year that trend data are available) to 2013, physician adoption of EHRs able to support various Stage 2 meaningful use objectives increased significantly. You are currently browsing the NCHStats blog archives for January, 2014.